ODIN partners are heavily involved in the Open Repositories this year. We organize a panel discussion and a developers challenge, meaning that we do not only want to discuss and explain persistent identifiers, but also trigger some “hands-on” development on the latest DataCite and ORCID APIs. We hope to see you around! The dev challenge starts on Monday, the 9th of June. DataCite and ORCID technical staff will provide a technical walk-through to introduce developers to the current APIs. Technical staff will be on-hand throughout the days to answer questions and actively facilitate participant projects. This challenge is to use the open APIs provided by DataCite and ORCiD to build an application or service based on these persistent, shared, and open identifiers. If you have an idea already, don’t hesitate to contact us and share it! As an appetizer for the challenge, we organize a webinar where you can learn about the latest tech details ahead of time. It will take place the 3rd of June and you can find all the details here! The discussion will focus on the challenges ahead of use: While substantial progress has been made, there are still steps to take, including disciplinary requirements and engagement of the researchers themselves in using the identifiers and data-sharing tools. One demanding domain is data publication, which involves new forms of citation, questions on how authorship should be treated, and lack of standards for crediting researchers who share their data. By the way, if you are interested in us, the ODIN’s partners, this is the unique opportunity to meet most of us in person. Our colleagues even come from Australia. So, drop us an email if you want to share a drink! For any further details, visit our OR14 section. Research data has been the main focus of data intensive scientific discovery for more than a decade; however, these days it has a wider audience both in scholarly community and public sector. Research data is transforming to be a first class outcome of research, and a key enabler for research collaboration. The third plenary of Research Data Alliance (RDA) in Dublin (March 2014) was a good demonstration of raising the international interest in research data. More than four hundred researchers and policy makers got together to talk about the future of research data and data infrastructure. find where their data has been reused in scholarly work. identify the opportunities for research collaboration where their investment in research data can lead to new collaborative research and innovation. Given the strong interest in discovery of research data among RDA members, interoperability was a key topic of discussion in many RDA groups, and DataCite and ORCID played an important role in these discussions. While DateCite is providing unique identifiers for datasets, ORCID enables the researchers to link these identifiers to their author identifiers, creating an open and transparent connection between researchers and their research outcome. The interoperability between ORCID and DataCite is essential to build a fabric of collaboration among research capabilities, and ODIN is the manifestation of this collaboration. It is apparent that ODIN outcome can be adopted with many RDA communities; hence it is important for ODIN members to continue communication of ODIN achievements with the RDA groups, and share the lessons learnt from this project. 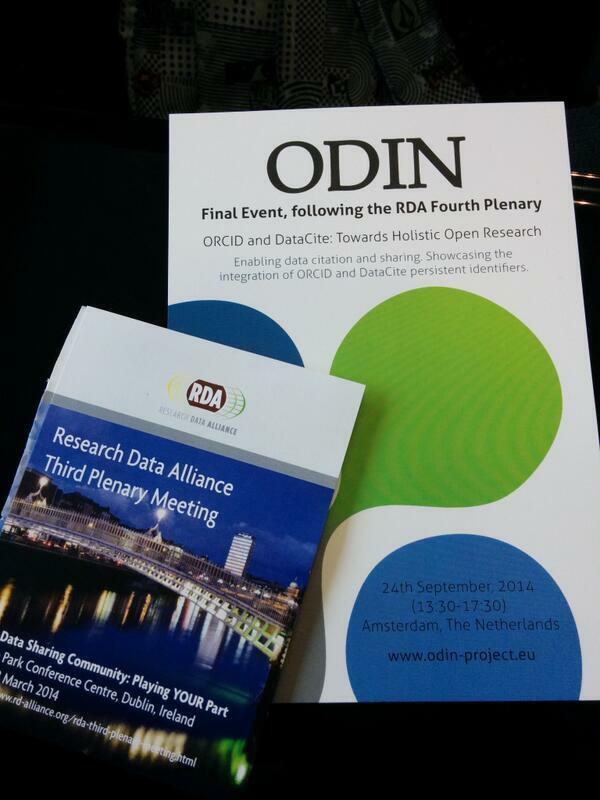 Many of our partners are present at the Research Data Alliance Third Plenary (RDA) that happens right now in Dublin. We also announced our final event, which will take place right after the fourth RDA plenary in September in Amsterdam. 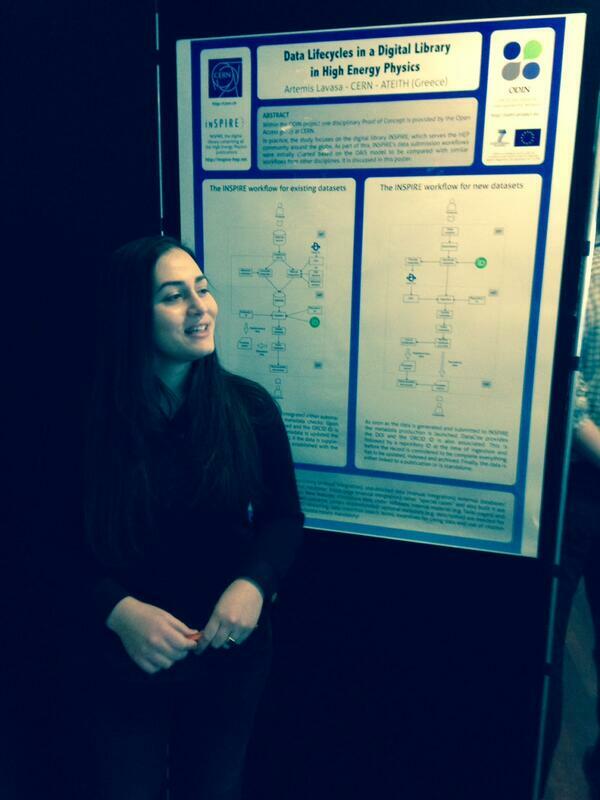 If you are around, come and see the ODIN poster. Artemis Lavasa charted a data management workflow within a digital library in High-Energy Physics. We are currently working on comparing this with Humanities and Social Sciences and many other disciplines. We pay particular attention to persistent identifiers and their role during the process. If you have similar experiences in your discipline, feel free to mail us and share your workflows. We are happy to include as many points of view as possible. In any case, stay tuned for our reports that are due this summer! One of the things we’ve discovered from talking with data-centres is that for many datasets they have scant author metadata, with little more that an institution name attributed. They’ve love the ability to pull claims information out of ORCiD and use it to selectively enrich their own metadata, thus completing a “virtuous circle” of integration. They’re also very interested in usage statistics and tracking the penetration of ORCiD within their own user-base. Until now it’s been difficult for data-centres to access this information – it required coding against the ORCiD search API. Until recent changes in the ORCiD API, if the data-centre was using non-DOI identifiers then it was not just hard to do, but impossible. With that in mind, we’ve developed a tool that makes it really easy for them to do so using a simple interface, without having to implement any code. The tool was initially developed to work with one of the ODIN partners data services, EThOS, and forms part of the same application. It’s freely accessible on the web and the code is open source. The underlying interactions with ORCiD are managed by a separate open source library that was also developed by an ODIN partner. The ODIN first year conference and codesprint event held at CERN October 15-17 marked the end of a successful first year of the project. The CERN codesprint was the first of several hands-on technical workshop scheduled in ODIN. The event took place Oct 15-16 and was attended by 20 experts, from both ODIN partners and from external organizations not directly involved in the project. The group decided to focus their energies on four projects, chosen from a longer list of candidate projects (see figure). All projects are summarized on the codesprint page, including links to project code shared via Github. The conference immediately followed the codesprint and lasted one full day, on 17th of October. The first part of the programme comprised an update from DataCite and ORCID and a summary of the first results from the project. The majority of the programme, however, was devoted to presentations from external speakers representing a diverse group of stakeholder organizations. The full conference programme and links to all presenter slides is available on the event website. Both conference and codesprint are covered in more detail in deliverable D2.3 First year communication report. Promoting and encouraging data citation. We have just released several project deliverables. As usual, all documents are published on Figshare, each assigned a DOI and linked to from our project outputs page.